Ellika Shilling is a Nationally Board Certified and New York State Licensed Acupuncturist and Certified Reiki Healer. Ellika earned a master level degree in Oriental Medicine from Southeastern Institute of Oriental Medicine in Miami, 2003. She practiced in the Fort Lauderdale area until she moved to Brewster and has been in practice in Brewster since 2006. She is passionate about bringing acupuncture healing to as many people as possible. She created The Village Acupuncturist’s Community Clinic and Putnam County Veterans Acupuncture Clinic to carry out that mission. Ellika finds inspiration through her work every day and is deeply grateful that she is able to assist people in finding healing for many different physical ailments. Another appreciation for her work comes from the emotional healing aspect that acupuncture has. Click here to learn more about acupuncture! You will most likely meet Sachi at the clinic. 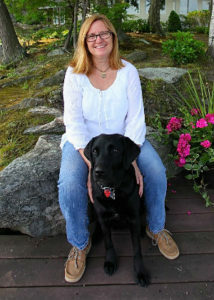 Sachi is a Guiding Eyes for the Blind (GEB)retired brood. She came to live with Ellika and family when she was 9 weeks old. She was destined to be a guide dog, but her excellent bloodlines, temperament and physique were the exact traits GEB looks for in their breeding colony. She has had 4 litters (17 puppies). A couple of her puppies are now included in the breeding colony, so Sachi is a Grandmother. Some of her puppies are now working guides. Sachi’s job in the clinic is with the meet-and-greet department, she welcomes everybody with a wagging tail when they come for treatments. Often during the treatments she chooses to nap in the treatment room and her K-9 healing energy is welcomed by all the clients.